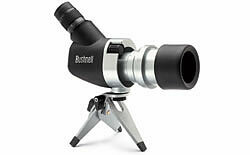 Our compact, collapsible Spacemaster® spotting scopes are ideal optics for those who realize this paradox regularly. With a telescoping design that packs down ultra-small, theyre easy to tote when the trail is a challenge. And your efforts are rewarded with bright, clear views through fully coated optics. Steady them with your hand using the scope glove or catch natures drive-in with the integrated window mount. Innovative design with a convenient 45° eyepiece.